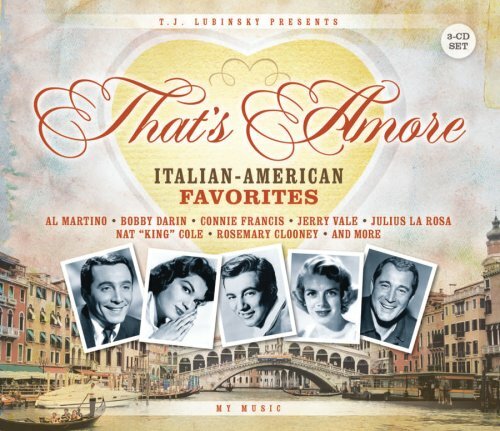 That smooth, bel canto style of balladeering imported from Southern Italy via Ellis Island came to dominate postwar pop, and this 3-CD set (which you may have seen advertised on PBS) brings you the finest 50 examples of the art form. Includes That's Amore Lou Monte; Angelina/Zooma Zooma Louis Prima; You Alone (Solo Tu) Perry Como; O' Sole Mio Mario Lanza; Mala Femmina Jerry Vale; I Have but One Heart Al Martino; I'll Walk Alone Don Cornell; Mama Connie Francis; That's My Desire Frankie Laine; Eh, Cumpari Julius LaRosa; Non Dimenticar (Don't Forget) Nat King Cole; Al Di La Emilio Pericoli; Mambo Italiano Rosemary Clooney; Beyond the Sea Bobby Darin; Nel Blu Dipinto Di Blu (Volare) Dpmenico Modugno; Oh! My Papa (O Mein Papa) Eddie Fisher, and more. Molto bene !